Sister Fidelis Hart, OSC, and her twin, Maude, were born on August 8, 1915, in Liverpool England. While she was a young child, she and her family immigrated to the United States, to New York. She attended a Capuchin Franciscan grade school, reading stories of St. Francis and Franciscan saints. At the age of 18, she entered the Carmelite Sisters for the Infirm on September 12, 1934, and made her First Profession with the Carmelite Sisters on March 19, 1936. On June 4, 1952, Sister Fidelis transferred to the Poor Clares in Memphis. Tennessee, and made her Solemn Profession on July 1, 1954. From Memphis she went to Saint Clare’s Monastery in New Orleans. In 1979, she was appointed spiritual assistant to St. Teresa of Avila’s Secular Franciscan Fraternity along with nurturing other SFO communities and many Secular Franciscans. In 2004, Sister celebrated 70 years of religious life and 50 years as a professed Poor Clare. From the beginning of its history until the present, Sister Fidelis was with Our Lady of the Pearl, providing spiritual direction and ongoing formation along with much mothering and guidance. She was our friend, our sister, our mother and our inspiration. She is our Mother of Pearl. Sister went home to God on October 22, 2012, at Our Lady of Wisdom, New Orleans, LA. In November 1922, after a stormy voyage across the Atlantic, we finally reached New York harbor. My father, who had sailed from England a year earlier, and two of his sisters met us. After a few days of rest my mother took the seven of us to enroll us in school. There was a large public school just opposite our new home, but to my English mother that meant a Protestant school, and she was determined to enroll us in a parish school. It was almost the end of the first semester so we met with refusals from the first two Catholic schools. Nothing daunted, she asked an Irish traffic cop if he knew of any other Catholic school. We learned that the Capuchin Franciscans staffed the little German church and the School of Our Lady of the Angels just one block away. We knew of Franciscans in England, but there were none where we lived. It was a moment of grace, for the Friars were to have great influence on our whole family through their kindness, solicitude and wonderful pastoral care. We were not treated as strangers by our schoolmates or neighbors but rather welcomed, and soon we felt quite at home. 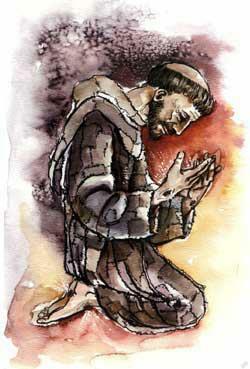 I owe my vocation as a Poor Clare to the teaching and wonderful example of the Capuchin Friars. I will never forget their care for the parishioners and school children, their outreach to the poor, and this of any denomination. They reached out to everyone. I learned of their missionary zeal throughout the world when we joined the Holy Childhood Society. We used to save every penny we could, and when we reached a certain sum, we turned it into Sister. Then we had the joy of naming some child, in far off China or South America where the Friars had Orphanages. In our Readers in school, we learned about Francis and Clare. I would read about them later in life as a Poor Clare. The Friars lived a gospel life and strove to attract people to Christ and His church. Like Francis and Clare they knew that this vision could only be lived in and through Christ by the grace of the Holy Spirit. They met Christ in their beautiful Liturgy, in the Scriptures, in their personal prayer and in Christ they experienced the unity of humanity. On my first full day as a Postulant at the evening meal, the Testament of our Holy Mother Clare was read aloud. It seemed as though Clare herself and Francis were welcoming me home. When I heard the words: “and the Lord give us our blessed father Francis as a founder, planter and helper in the service of Christ” (Cl. Test. 59). I knew that I was where I wanted to be and the two friends of my childhood were indeed welcoming me. I was called as the Friars were to live an evangelical life. As Madge Karecki, SSJ-TOSF has so truly stated in an article on our Call to Contemplation: “It is a life that unfolds in two, directions: one interiorly through contemplation and exteriorly through mission. They are not opposing forces, but rather two foundation stones of our charism.” (TAU March 2002). Our Apostolic mission is to pray and work for the soul of the world. Source: Sister Katherine, O.S.C. Wrapped in Joy: Franciscan Poor Clare Sisters Share Special Stories. Dallas, Texas: DWH Publishing, 2004. I was evacuated to the Golden Age Home in Welsh as I could not reach the Monastery in New Orleans, thru the kindness of the Carmelite Sisters. The authorities there gave me access to a computer. By some unexplainable e-mail fluke I heard of the White Deer. I took it as sign from Francis that My Pearls were under his protection and I was greatly comforted!! I have tried to put this on my page but I need your help. My name is old English for deer. A deer is a hart. I never lost hope and in amid our suffering. It was a great Joy! On the 1st of October we celebrated Eucharist and buried Maude. It was a beautiful day! Maude had peacefully welcomed Sister Death and met her God. The joy of her release was quite evident and even the Monsignor, during his ceremony at the wake, remarked that it was a happy wake. Sr. Marjorie always conducts the funerals here in such a beautiful and warm manner that I love to attend and we have them often. Sister invites the friends and family to celebrate the life and death of their loved one. Sister knows the 138 residents and always has some little story to relate that cheers and comforts the relatives. I had prayed earnestly that Maude’s passing would be the same, and God heard my plea. Monsignor’s sister is also a Poor Clare nun and it added to the warmness of the celebration. In the evening section of the wake, Maude’s Franciscan Fraternity came, the whole Council and some recent vocation she had instructed. They conducted the updated Franciscan Wake Service our Region had mailed to them. Then each of them shared how much she was loved and what a wonderful example her Franciscan life was, and still is, for them. Then Larry, her eldest living son, called on me to say a few words. “Comfort thyself: What comfort is in me? When I visited her in June, she mentioned it again, when first she knew that she suffered from incurable cancer. I believe it reminded her of Francis’ last words as he lay dying. “I did what Christ taught me to do. May he teach you what you are to do.” Maude, the Church which you so loved and served so well will pray at your funeral: “May the Angels lead you into paradise; may the martyrs greet you at your arrival and lead you into the holy city, Jerusalem.” Did you sing with them, Maude; and surely they sang: “Ceade mile failthe, a hundred thousand welcomes, Ceade mile failthe.” Maude had a hard life, but the virtue of Hope, ever alive in her heart, kept her trust firm. In the midst of sorrows, adversities and even betrayals she knew that like St. Francis, we carry about the dying of Jesus so that we can revel in the living of the Risen Lord. I thank all of you for joining us in the Celebration of her Life and Death. I too must let go and I do so willingly for my twin has seen the Face of God. “Beannachd leibh, Allana”, “Beannachd”! Thank you for the Mass offering. It will next week; I want to be present that day. The silk painting, shown above, is by Ty Mam Duw, Poor Clare Colettines, Hawarden, WALES GB. Their website is here. Ty Mam Duw is Welsh and means The House of the Mother of God. The image is used with permission. In October 2007, through the invitation of the Holy Spirit, the Poor Clare Colettines, Ty Mam Duw, and Our Lady of the Pearl were brought together via the internet and email. After about ten days, we learned that approximately 20 or more years ago, Sister Fidelis visited these same Poor Clares in Wales, and they were brought together again through e-mails. The steadfast love of the Lord never ceases. He is good, all good, totally good, and his wonders never cease.